If folks here can't free dive on it, often they'll mark it with a float and come back later. You got that right. I dove my anchor in Charleston, SC and after five feet I couldn't see my hand in front of my face. It's all by feel. But at least you get your anchor and chain back. If you think you need that pick a cheaper anchor. Have you been looking at the Ultra? If you can't free the anchor with the boat and/or dinghy, you better have scuba if you are going to try to do by manpower. I've never run across a situation where I'd need to do so and am having a hard time imagining one. But being able to dive on it is nice; let's you see exactly what the issue is if stuck, and how ell it's set if you are just curious. I am enamored of this idea and cheap. Get a length of heavy chain, maybe 4 or 5 feet. Around your anchor line, loop 2 coils and join chain ends. Attach a rope the one loop of chain, leave other loop free. Motor over so anchor line is vertical, will help it drop down. Drop heavy chain coil down anchor line. Chain coil should drop all the way down anchor shaft. Pull on rope attached to chain coil opposite of direction anchor line runs. It should tighten the loose chain coil around anchor gripping the shaft. Then it should be able to back out a stuck anchor. It all depends on the heavy chain going all the way down, which if heavy enough I think it would. Wifey B: Darn. I thought someone was talking about an insurance policy for anchors when I saw "Anchor Insurance." having tried the chain loop (single...wouldn't even bother with double loop) with only hit or miss success as an assistance tower (probably 20 times in my life)....I would rather carry a 3 foot section of heavy duty galvanized cable with two small loops in the ends. I would wrap that around the rode and shackle..hopefully it is stiif enough to form a circle and attach a stout line to it by making a loop through the shackle so it is still retrievable if the cable also gets fouled. I was just thinking some more, to keep 2 loops from cinching down before they fall down to the anchor, you could use a small weak zip tie or some weak fishing line to temporarily secure the loops together where you attach the pulling rope. Then when pulling hard it will break the tie and allow the chain to cinch down on the anchor. I have never had an anchor get stuck yet to need to try any such thing..
Chain can work...but too easy to snag on things...that's why I suggest a loop of heavy wire. The only time I really got an anchor stuck, as a last resort before applying a hacksaw to the chain, I tried the chain loop as a friend had recommended similar to post #8 above and the anchor, a "virgin" 45# Delta backed right out. I'm more worried about losing chain more than the anchor. Anchor trip float with 1/4" double braid line between the eye on the business end of the anchor to the float. I have 50' of line and adjust the length based on the anchorage water depth. I'm thinking of reducing the trip line length to 40' and rigging the float so the line passes thru the float eye and attaching a large shackle/weight to the bitter end so it will self set from 20' to 40' above the anchor. Not a bad idea HiDHo but unless you leave the length of the line with the weight long enough, I don't think that it would slide smoothly over the eye of the float. You could always spend $400 on that self adjusting gizmo that was posted in one of the other anchor threads. I have never used an anchor buoy, but I think I need to give it a try. Water around here is usually too deep, too cold, and too murky to be able to dive on without full scuba gear. "and attaching a large shackle/weight to the bitter end so it will self set from 20' to 40' above the anchor." If the weight used is a proper sounding lead , you can test the bottom if desired,before anchoring. We have used this ,line thru the ball bail, to anchor crown and so far 3/8 line has never failed at unsticking an anchor, even before installing a Hyd windlass. Scuba is fine in warm water but at times we travel and the water temp is 40F or so. Up here in New England, it's a pretty good practice when anchored in crowded anchorages, to deploy an anchor sentinel, a small float on a line attached to the crown eye of the anchor. You would normally set out enough sentinel line slightly more than the high water over your anchor. My sentinel float is painted fluorescent orange with my boat name printed on it. The sentinel shows other boaters where your anchor is, hopefully to avoid someone dropping their anchor on yours, or across your chain. If the sentinel line is strong enough, you could use it to pull a fouled anchor from the opposite direction. While anchored and fishing in craggy areas, it's a common practice here to use a sentinel. I've had to pull a fouled 22# Bruce out with the sentinel a couple of times. I've been toying with this idea in my mind but haven't put it into action yet. Tell me what you think. Attach a 50 ft length of 1/4 or 3/8 inch 'release' line securely to the hole at the very fwd end of the anchor. Using lightweight zip ties or light frangible string, attach the release line to the anchor shank and along the first 50 ft of anchor chain. (I seldom anchor in 50 ft...normally 30 ft.) If the anchor hangs up on the bottom, retrieve rode until overhead the anchor. 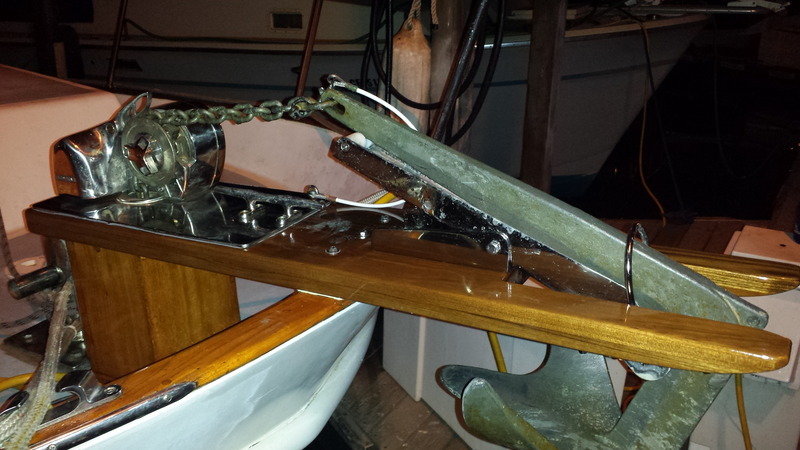 Cut the ties to the anchor chain to allow the release line to be secured to a cleat. Slacken the rode and retrieve the release line manually or with the windlass. The release line should either pull free from the rode by snapping the ties or pull through the loose zip ties to tighten the release line. Pull anchor vertically to retrieve. I'd have to keep an eye on the condition of the zip ties or frangible string but I think it'll pass easily through my windlass. The last foot or two could be woven into the chain to keep that tag end more secure to prevent a hangup entering the gypsy. If I ever need it, it'll be there in position ready to use. No need to separately deploy a trip line and float each time I set anchor. I'm going to go out on a limb here and make a guess that not all boat owners are trained and physically able to dive twenty feet and struggle with a stuck anchor. What you're thinking of is my setup thanks to FF's suggestion. I haven't actually used it yet because we haven't been in a questionable area. The one time I used the traditional method, I estimated the line length too long and the boat passed over it a couple times in the night. Luckily I was able to get it untangled without difficulty. I saw something on Facebook where a boat was using a large rubber ducky instead of a traditional round float.